Birmingham City have signed teenage midfielder Luke Maxwell from National League strugglers Kidderminster Harriers for £75,000 on a three-and-a-half-year contract. Maxwell, 18, who has been loaned back to Harriers for the rest of the season, has made 22 appearances this term. Harriers have confirmed that the fee will be paid in instalments. "It's a move he's delighted to make. He's earned a lot of admirers," said Harriers chief executive Colin Gordon. 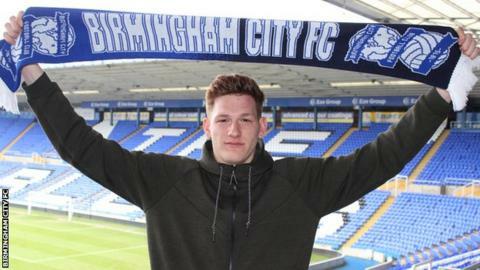 "Birmingham have been a pleasure to deal with," added the former Blues striker. "They know they are getting a player who has the potential to really succeed in the game." Harriers sit bottom of the National League, 13 points adrift of safety with 20 games of the campaign to go.